Here is the enhanced demo of World of Ninjas! It's a 2D top-down view stealth game, somewhere between "Commandos" and "Hotline Miami", where you can create your own levels. Goal: On each level, get the sword(s) and escape far away from the buildings (in any direction you want). Just get far enough (in reality you have to leave the level area). 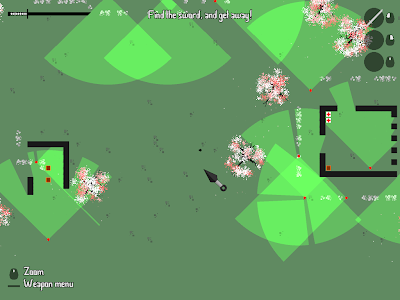 Controls: arrows or [zqsd] + space + mouse. By default it's AZERTY-friendly, but you can change the config in 5s on the splash screen. Use Paint or whatever image software you like to create a PNG file with a black background in the "Levels" directory. Levels don't need to be huge to be fun; 100x100px is already enough, but you can create whatever size you want. Yellow Pixel (255,255,0): path for the enemies. An enemy will follow a path if he's just NEXT TO a yellow pixel. You can use a single yellow pixel to make an enemy move to it an look in that direction. Don't hesitate to check out the available levels to get an idea of the color use. Be careful, you need to use the exact color codes (R,G,B) described above. Don't hesitate to send me your levels if you achieve to create something cool :). May be I'll add them to the next version of this game! And as usual, contact me for bugs or any feedback. Thanks guys, and I hope you'll enjoy it!